Zachary Alexander Bagans was born on 5 April 1977, in Washington, D.C. USA, of German, Italian and Czech descent. He is a television personality, actor and paranormal investigator, also known as an author. Bagans is probably best known for being the host of the television show called “Ghost Adventures”. In addition, Zak is involved in various business affairs and has many different activities. Zak is considered to be one of the foremost paranormal investigators in the industry. If you consider how rich Zak Bagans is, it can be said that Zak’s estimated net worth is $1.5 million; the main source of his wealth is obviously Zak’s career as a paranormal investigator. Undoubtedly, his appearances on various television shows have also added a lot to this sum of money. In addition to this, Zak’s other activities and business affairs also make his net worth higher. If he will continue working hard, there is a high chance that this sum will become higher. Zak studied at Glenbard West High School, and later continued his studies at the Motion Picture Institute. 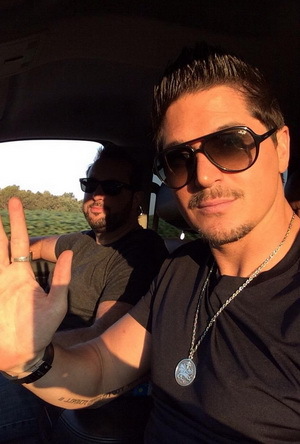 Soon Zak became interested in paranormal activities and started learning more about it. Although at first Begans was very skeptical, his opinion changed when he saw the spirit of a woman in his own apartment. In 2004 Zak, Nick Groff and Aaron Goodwin came up with the idea of creating a show about paranormal activities. This show is now known as the “Ghost Adventures”, and is now airing its 11th season, and still very popular all over the world. There is no doubt that the success of this show had a huge impact on the growth of Zak Bagans’ net worth. In 2011 Zak started working on another television show, entitled “Paranormal Challenge”. What is more, Zack was a narrator and a host of “Ultimate Travel: Legends of the Park”; these also contributed significantly to Bagan’s net worth. Other shows that Zak has worked on include “Paranormal Paparazzi”, and “Ghost Adventures Aftershocks”. As mentioned, Bagans is also known as a writer, and together with Kelly Crigger he has written a book called “Dark World: Into the Shadows with the Lead Investigator of the Ghost Adventures Crew”. What is more, Bagans has collaborated with such musicians as Praga Khan and Lords of Acid. These activities have added a lot to Zak Bagans’ net worth. It is clear that Zak is a very active person who always tries to involve himself into new projects. In his personal life, Zak has apparently been dating Chtristine Dolce since 2013. All in all, it can be said that Zak Bagans is one of the bests paranormal investigators, who was able to turn this activity into very successful television shows. These shows gained a lot of attention and now there are many fans who are waiting for new shows, created by Zak. On the other hand, Zak is involved in many other activities and he has also achieved success in different spheres. Undoubtedly, Zak is a very hardworking personality who has already achieved a lot. 1 I don't hunt ghosts, I communicate with them. 1 He had a dungeon built in his former house, in Las Vegas. 2 He attended Glenbard West High School, Glen Ellyn, Illinois. He graduated on January 1995. 3 Has 2 scars on each eyebrow. 4 Favorite colors: black, red and silver. 5 On February 1998 he was on Las Vegas Wheel of Fortune for Family Week along with his sister. 6 Allergic to red fruits, prawns, pumpkin, spinach, calf, rye, paprika, grapes and almonds. 7 Loves animals, above all dogs. 9 After graduating in high school he attended Western Michigan University only for 8 months. He later graduated at Motion Picture Institute of Michigan. 10 Adopted a dog named Gracie from Nevada Society for the Prevention of Cruelty to Animals. 11 Appeared in a Lumber Liquidator commercial. 12 He has 7 tattoos: an angel/demon behind his neck, symbol of the battle between good and evil he faced on his investigation on Poveglia Island, Italy (2009). A little Christian cross on his right index. A big Celtic cross on his left arm. An Aries symbol on his right arm. Dracula's cross on his right wrist. The writing "Denn die Todten reiten Schnell", German for "for the dead travel fast", a quote from Bram Stoker's "Dracula", on his inner left arm. Number 11, near the German writing, symbolizing his apologizes to a female spirit he mocked while investigation on room n. 11 of Silver Queen Hotel, Virginia City, back on 2004. 13 Huge fan of Vlad III Tepes, aka Dracula. 14 He's of Italian, Czech and German descent. 15 He has an elder sister, Meredith and two younger half-siblings: Sky and Phil. 17 He worked as a Vegas Voltage DJ for weddings in Las Vegas. 18 Favorite subject at school was Poetry. 20 Has a fear of snakes, heights, clowns and "creepy-looking" dolls. 21 Met and befriended Ghost Adventures (2008) co-creator Nick Groff at Las Vegas in 2004, as Nick hired him as DJ for his wedding. 22 He is a graduate of the Motion Picture Institute.